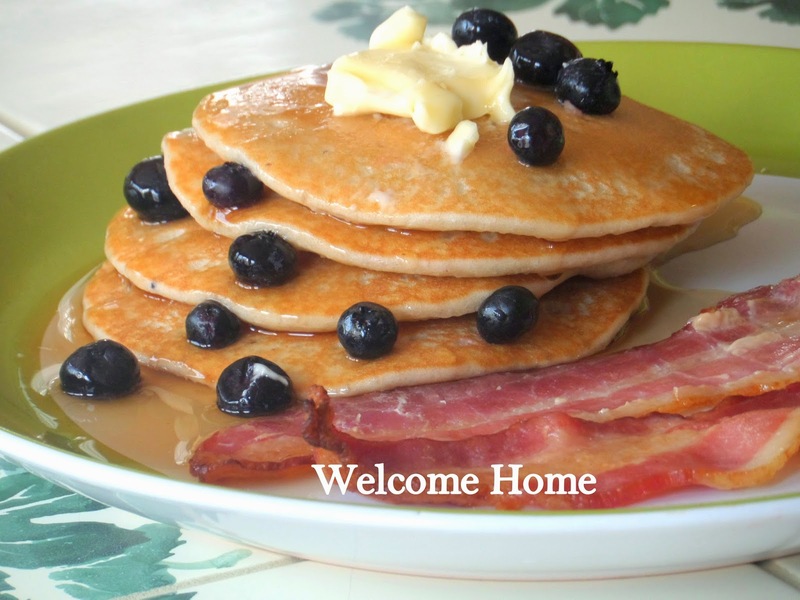 I made blueberry pancakes and bacon this past weekend. I tried making my bacon in the oven for the first time and I'm so glad I did. It's so much better than frying it and watching it shrivel up. It stays true to its shape and it just tastes better...and no more wondering what to do with all that left over bacon grease! Whisk flour, sugar, baking powder, baking soda, and salt in medium bowl to combine. Whisk egg and melted butter into buttermilk until combined. Make well in center of dry ingredients in bowl; pour in buttermilk mixture and whisk very gently until just combined (a few lumps should remain. Do not over mix. Chop or slice the blueberries you plan to add to the batter but leave some whole for the topping. Heat 12-inch nonstick skillet or griddle over medium heat for 3 to 5 minutes. Add 1 teaspoon oil or butter and brush to coat skillet bottom evenly. Pour 1/4 cup batter onto 3 spots on skillet ; sprinkle 1 tablespoon of chopped or diced blueberries over each pancake. Cook pancakes until large bubbles begin to appear, 1 1/2 minutes to 2 minutes. Using thin, wide spatula, flip pancakes and cook until golden brown on second side, 1 to 1 1/2 minutes longer. Serve immediately, and repeat with remaining batter, using remaining vegetable oil only if necessary. Lay bacon strips flat on a rack above a baking sheet lined with foil. Bake at 400 degrees until bacon is the way you like it! Delish!